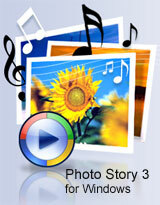 Microsoft Photo Story 3 for Windows helps you create exciting video stories from your pictures that you can share with family and friends. For example, you could create a video story that features narrated photographs from a family vacation or a video story that includes pictures and sounds of your new baby. In a few simple steps, you can import and edit your pictures, add titles, record narration, add background music, and save your story using the optimal quality settings (profile) for the way your story will be played.